Write and publish a post stating your intention to participate. In the post please include the Challenge graphic and a link back to this post. Then link your intention post at the bottom of this post. Make sure it is the actual post and not just a generic link to your blog. If you do not have a blog, leave a comment with stating your intention below and how you are going to track. Add your reviews back here on the link in this post. At the end of every three months there will be two prizes of U.S. $15 prize with a book of your choice from the Book Depository or U.S. Amazon voucher, for the entries. There will be a new linky then for the next quarter and so on to the end of December. Reviews are not mandatory and if you prefer to keep a list of the books read and the category they cross off the card, then you can still enter for the completion of a Full House by linking to that list on the final linky or in a comment. The list could be kept on somewhere like Goodreads or in a Google doc. If you are on Goodreads but don't have a blog you might like to link your reviews to the linky to be in to win the quarterly prizes. Or any place where you do reviews on the web. Each review can only be linked up once in the year. However it doesn't matter when you read the book in 2018 - which month, just link as you remember or have time. So if you read it in January you may not get around to linking it until say... May. That is fine. Books may cross over from other challenges that you are doing. However a different book for each square, one book cannot cover two squares. There will be a final post to link in a summary post for the challenge for those who have completed a full house. This will close on the 2nd January 2019 and a winner will be chosen using random.org for one U.S. $40 prize which again can be used to buy books at the Book Depository or be received as an Amazon voucher. Often participants never come back to link to the completion line! I will therefore open it early so that you can do it and forget it! Will go live very soon. Now Open I have changed over to WordPress.com so the link will take you to my new site. It looks a lot like this one! Obviously some of these will be either fiction or non-fiction, but there are others that could be either and so that is your choice which way you go. If you have any questions just leave them below in the comments. I imagine this will be fun to participate in! Yay, I love your challenge! I'm in again. I still have three books left to finish for the 2017 challenge. Thanks for hosting! I'm in! I am going to write my post about the challenge tomorrow. (I'm getting ready to watch some football!) Thanks for hosting this. I love a good challenge. Looks like fun! Are book that are "read" through audio ok? I am in and can't wait to start!! This sounds fun. Okay, I've bookmarked your post for next year. I'm going to try it! I'm in again this year. Still one more to go for 2017, but I had a blast stretching myself into reading some of the categories! what's a dual time line line and what does NF stand for? Thomas - thanks for asking. Dual time line is where a book has a story going say in the present and one going back in history sometime. So two stories going on but usually interlinked. I'm in! 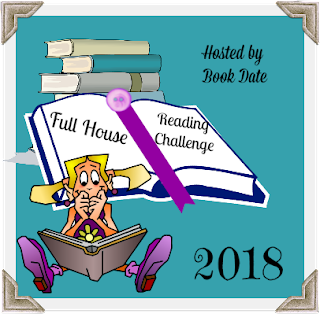 I have a huge TBR list so hopefully this challenge will help my plow through it. Or maybe it'll just add to it! 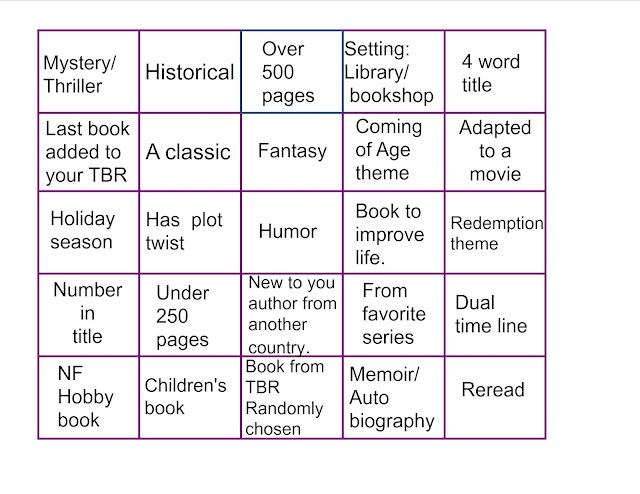 I don't have a blog and since I'm a bit of a Luddite, I'm going to make a paper version of the bingo board so I can cross off as I go. I do have Goodreads though, so I can keep track and review there. Great Muriel so if you link your reviews up you can enter in for the giveaways as you go and just leave a comment on the final link up to say you completed and I will include you in the draw. so doing list anyone any idea for library or bookshop? Thomas I'd just keep an eye out and decide the book as the year goes by. This challenge doesn't require you to set all the books straight away. Although I guess you may want to. Hi! I just read my "bookshop" book so I figured I'd recommend it to you. It's called You by Caroline Kepner. It's creepy AF and so interestingly written. It's all written from the stalker's POV as if he's writing to his victim. He works in a bookshop and I'd say about 75% of it takes place in the shop, so I hope that counts! Certainly counts Muriel. Not sure if I'd be able to read it as I am not good with creepy!! Lol don't do it! I don't know why but I've read so many books lately that make me never want to date again. Purely by accident. I think, "Oh, this looks good" and then there's a psycho stalker boyfriend. I don't read romance but I feel like I might have to start, just to balance it out! Hi! I joined in your 'Read the Books You Buy' challenge last year and was wondering if there will be a wrap up post to link up my progress? 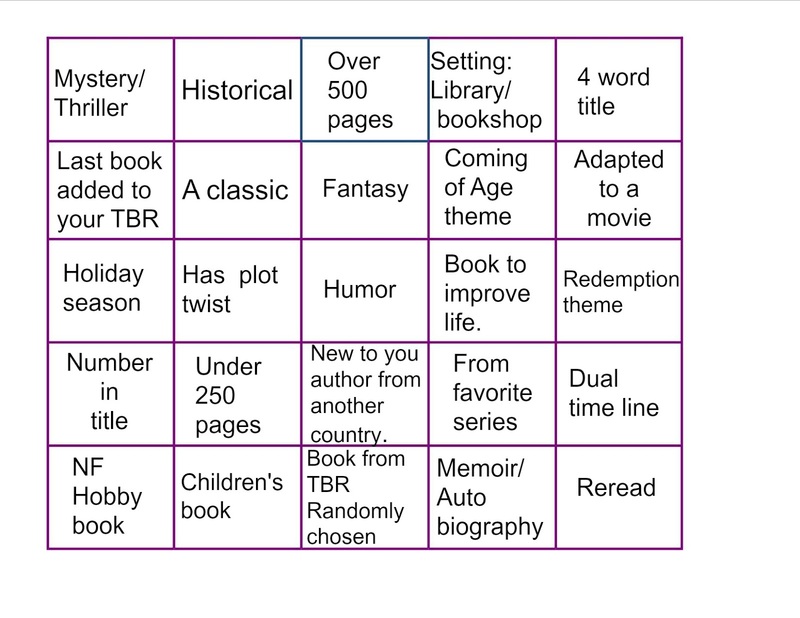 :) This challenge looks fun, love a good bingo card! Some of the categories seem quite challenging. Keen to take on the challenge. Will soon do a sign-up post. BTW, is there no Free exchange, this year? Great! Now please tell me what exactly is Holiday season (is it Christmas and/or something else?) and in the four-word title do articles and prepositions count? Yes Christmas and I guess for others there are many kinds of holidays that they celebrate that may be set in a book. Hmm 4 words, I guess prepositions and articles could either be counted or left out at each reader's discretion. Thanks Kathryn. Have signed up for the challenge and can't wait to start crossing out the categories done. what do you mean for "Coming of Age theme"? Welcome. Where a character through the challenges faced in the story grows from those teen years into adulthood, or steps quite a bit further towards it. I keep participating and then never remember to check in. Oh well, either way it's fun. I'll try to remember this year. I enjoyed taking part in this one last year and am looking forward to participating in this year's version. Thanks for hosting and setting it up again. "Historical".. can it be a fiction book? An invented story which takes place in a specific (and well specified) historical period? For sure. Sorry so late replying to this found it in my comment moderation folder. Had forgotten to look there! Sue so sorry about this, and just found your comments in the awaiting moderation section. I will put up a post for the completion one for 2017 very soon. Entering my participation for this great challenge, Kathryn, and will work on linking reviews to books read under Oct-Dec. Sorry health keeps interrupting reading interests! but doing my best. Thanks for hosting this annual enjoyment !